Our compassionate, expert caregivers are at the heart of all we do at The Springs. We believe in strong personal relationships as a foundation for our care. Technology has the power to enhance those relationships and to advance the care we provide at The Springs. We’re proud to offer innovative ways to connect with our residents and families while remaining true to our mission of old-fashioned, personal care. Learn more about how we use technology at The Springs! Our proprietary CaraSyst® technology allows family members and staff to stay informed about a resident’s care. By documenting services provided and any changes in resident needs or condition, we can better manage care delivery. CaraSysted™ Living ensures that each resident receives the personal care necessary to maintain optimal wellness. Family members can register and have access via a secure internet portal to follow their loved one’s care. Having real-time information allows family members to make the most of their visits with loved ones rather than spending valuable time getting updates from staff. Before a new resident moves into The Springs, our resident care director will coordinate a care assessment. This assessment helps our staff understand the unique needs of each resident and is used to develop an initial care plan. Periodically, or as a resident’s condition changes, the care assessment is updated with the family. Each resident’s care plan is tailored to meet his or her specific goals and desires, identifying both care management and hospitality needs. Caregivers use wireless hand-held computers to access the care plan via CaraSyst® and to document care management and residential service delivery. Repeated non-planned service requests and changing conditions are reported in real time, allowing our resident care director to address any immediate “red flags” and take appropriate action. The final piece of the CaraSysted Living program is outcome reporting. CaraSyst documentation and review ensure our accountability for each resident’s care and happiness. Periodically, our resident care director will prepare resident care management summaries from CaraSyst to review with management and staff and also to help families understand specifics about the care of their loved ones. IN2L is an easy-to-use computer format especially designed for seniors. 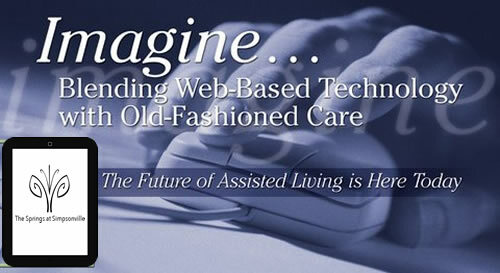 The interface allows seniors to use computer technology regardless of their abilities or physical or cognitive limitations. IN2L makes it easy for seniors to have online opportunities for social connections, discovery and learning, and gaming to stimulate interests and promote cognitive performance. IN2L opens a new world for many seniors and can be used independently or in group settings. The Springs has adopted a state-of-the art E-MAR system that allows our staff to coordinate with both physicians and our pharmacy to ensure fast and safe medication acquisition and administration. Built with an electronic library of pharmacy information as well as resident identification, our staff scan residents’ picture identification to be certain the correct medication is delivered to them. The system includes time-stamping for more accurate record-keeping and allows staff to monitor trends in areas such as medications that are refused. The system uses safe packaging methods for medications and tracks dosages delivered. The SimpleC Companion Tablet is an extension of the award-winning SimpleC technology that we will be beta testing soon. A touch-screen tablet delivers comforting, familiar sounds and pictures to residents while helping them maintain a reliable daily routine. Family members assist by providing favorite photographs and music their loved one especially enjoys; these sounds and pictures are uploaded and become tangible ways to connect with old, deep memories that remain strong despite cognitive impairments. The tablet not only allows meaningful one-on-one interactions through connecting with each resident’s life story, but it also promotes visual and auditory stimulation. Icons and touch-screen technology make using the tablet a simple, effective alternative to drug-dependent interventions for residents who may become anxious or agitated. Visit http://www.simplec.com or watch these short videos to learn more about SimpleC.